Jose Mourinho is still confident about Manchester United’s chances of signing Belgian defender, Toby Alderweireld. The 29-year-old Tottenham central defender has been linked with a move here for much of the summer given that he has only a year left on his contract in North London. However, talks have not progressed as expected as Spurs are demanding a whopping £70m for his signature. However, Jose Mourinho believes that he will still get his man as he thinks the pressure to sell the player will be too much for the club to refuse. He is banking on the prospect of signing him for a reduced fee next January in a repeat of the Alexis Sanchez transfer to United from Arsenal in January. 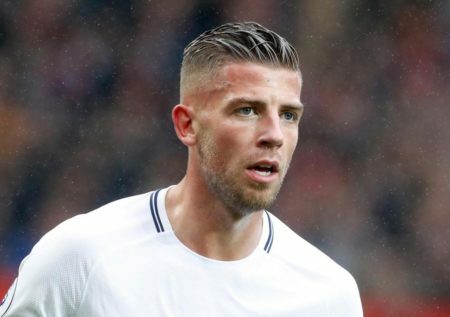 Alderweireld is also ready to leave the club after falling out with Spurs boss, Mauricio Pochettino past. He was injured at some point in the campaign but struggled to get back into the starting 11 as the manager preferred a partnership between Davinson Sanchez and Jan Vertonghen. Tottenham and Manchester United do not enjoy a particularly excellent relationship when it comes to the transfer of players; Daniel Levy is a tricky negotiator and Spurs have rejected the attempts of United to sign the likes of Eric Dier, Luka Modric and a host of other Spurs players. The Manchester Evening News though, report that Mourinho is upbeat about the chances of United signing the player, as he believes that a repeat of the Robin Van Persie deal that saw the Dutchman swap Arsenal for United. Arsenal had been hellbent on letting him join United but the deal still came through, with the former Gunners captain leading United to another Premier League title in 2013. Alderweireld is wanted by Mourinho to add more steel to the United backline, as well as quality in possession. He was excellent for Belgium at the last World Cup, helping the European team place third. I would rather have Varane with one leg tied behind his back than Alderweireld.